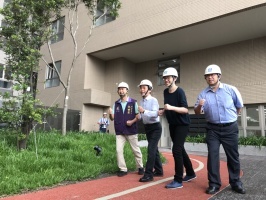 Today, vice mayor of Taipei City came to visit and report to the press about the case of Xinglong Public Housing Block 2 (興隆二區公宅). This case was there in former mayor's time, and finally, in this June, the architectural construction is completed. However, concerning that residents will be moving in, it's hard for architects to relax. New work for us just started!